Home » What's up: Events » Chinese New Year: Celebrate The Year of the Pig in Lyon! 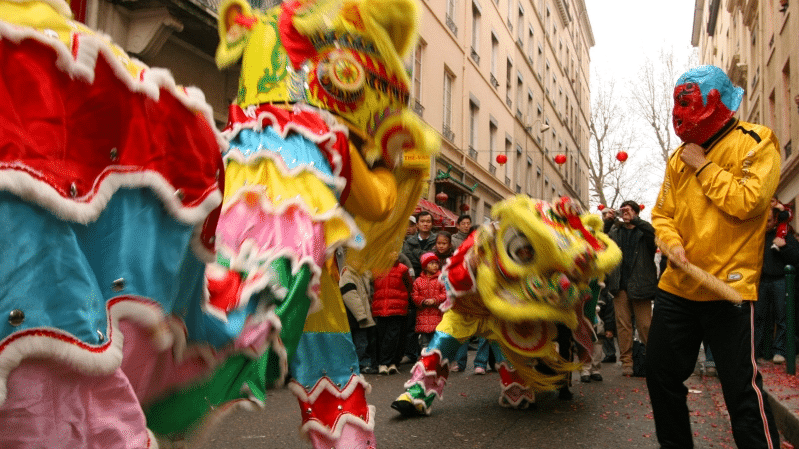 If you want to celebrate Chinese New year in Lyon, there’s plenty to do, and the Guillotière festival is certainly not to be missed on the 5th of February. Guillotière is now well-known amongst the Lyonnais for its colourful and musical Chinese New Year celebrations. You can expect dragons and lions dancing down the street in a colourful festival. This year, Chinese New Year falls on 5th February 2019. The annual Guillotière festival will take place on Sunday 10th February 2019 from 11:30am until 6pm. The parade itself will start at 3:30pm from Rue Passet, in Lyon 7. But aside from the parade, there will be food on offer, as well as martial arts demonstrations and dances. You’ll be happy to hear that Chinese New Year provides the perfect excuse to grab some Chinese food – I mean, who doesn’t love Chinese cuisine? There will be street food stalls at the Guillotière festival which aren’t to be missed – cheap and flavoursome dishes are always a winner. But if you fancy something a bit more formal, why not book into one of Lyon’s great Chinese restaurants, such as Engimono? Their website can be found here. There are other ways to celebrate Chinese New Year in Lyon. One option is to book in for a traditional Chinese massage at Ju Yuan. Or if you’re keen to learn more about Chinese culture and language, sign up for Chinese classes at ACOM Lyon (Association des Chinois d’Outre-Mer à Lyon et en région Rhône-Alpes).